NEW YORK (CNNMoney.com) -- The National Highway Traffic Safety Administration proposed a new auto safety regulation Friday that would, essentially, require rearview back-up cameras in all new cars, pickups and SUVs by 2014. Based on the proposal, drivers must be able to see directly behind the vehicle whenever the vehicle is shifted into reverse. The rule would be phased in over the next four years, starting with 10% of new cars sold expected to comply with the mandate by Sept. 2012; 40% by Sept. 2013 and 100% by Sept. 2014. The rule was demanded by legislation passed in 2007, called Cameron Gulbransen Kids Transportation Safety Act. The act was named after a 2-year-old boy who was killed, when his father accidentally backed over him in the family's driveway. "There is no more tragic accident than for a parent or caregiver to back out of a garage or driveway, and kill or injure an undetected child playing behind the vehicle," said Transportation Secretary Ray LaHood in a statement. "The changes we are proposing today will help drivers see into those blind zones directly behind vehicles, to make sure it is safe to back up." 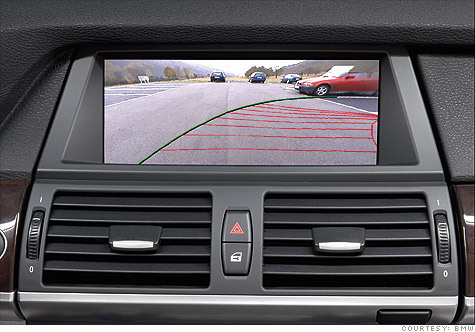 Rear-view cameras are a common feature on new luxury vehicles, especially SUVs. They are available as options on many other vehicles as well, usually as part of an option package including other features -- such as navigation. Benefits vs. Costs: According to NHTSA, this "blind spot" regulation could save 95 to 112 lives per year, and prevent 7,000 to 8,000 or more injuries. The agency estimates that the addition of rear-view camera equipment would cost between $159 to $203 per car, or $88 to $158 on vehicles already equipped with some sort of display screen -- like one used for navigation. NHTSA says the total approximate cost to equip their estimate of 16.6 million vehicles sold in 2014, would be between $1.9 billion and $2.7 billion. As a cost-friendly alternative, the agency could require that some vehicles be equipped with an audible warning device that would sound if it detected an object approaching. However, the agency said tests have shown devices like this to be less effective. Within their proposal, NHTSA said that the additional costs of this regulation would be worthwhile, because so many of those killed are children. Backover accidents cause an average 229 deaths and 18,000 injuries per year, according to NHTSA. The agency said that small children and the elderly are particularly vulnerable. Of those killed each year: 44% are under the age of 5, and 33% are over the age of 70. "In some of these cases, parents are responsible for the deaths of their own children," the agency said in its report. "Avoiding that horrible outcome is a significant benefit." NHTSA is allowing a 60-day period for public and industry comment on the proposed regulation.